Diamond Bracelets also on sale. Visit Bella Design Jewelers in Chagrin Falls or Eton Chagrin Boulevard (inside the mall) for selection of styles and pricing. Join us for a Holiday Celebration on Thursday December 1st, 4 to 8 pm at our Chagrin Falls/Bainbridge store. Enjoy drinks and light hors d' oeuvres while shopping sterling silver jewelry from local Cleveland artists Zenia Lis and Amy Pennell. We are also excited to host a Qudo Jewelry Trunk Show. Qudo is a new line of stainless steel jewelry with rose or yellow gold accents. 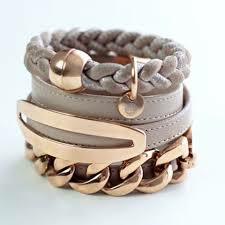 You may have already seen and fallen in love with Qudo leather wrap bracelets in our stores. At the Trunk Show, you will have an opportunity to try their composable rings featuring interchangeable colorful crystals. With prices starting under 40 dollars, Qudo jewelry makes wonderful gifts for many on your holiday shopping list. And don't forget to fill out your personal Holiday Wishlist to make the holidays bright! Trunk Show featuring VSA Jewelry. Join Bella Design in Eton -Chagrin Boulevard for a show featuring VSA Jewelry along with fashions from Audrey Sweet Threads http://www.etonchagrinblvd.com/tenant/audreys-sweet-threads/ - Thursday November 3rd from 5 to 8 PM. Shop the great looks while enjoying light drinks and refreshments. Enter for a chance to win raffle prizes at both Bella Design and Audrey's. with old world charm for a look that you'll fall in love with. Come to the show for a chance to see an extensive selection of the line. If you can't make it on Thursday, drop into Bella at Eton on Friday for a chance to see the VSA line of spirited jewelry. And for our Bainbridge folks, we will show the line on Saturday, November 5th from 11 am to 5 pm. Much, Much more to see and experience at the Trunk Show! Don't miss it!